C.F. Kingston and Sons are highly skilled, traditional stonemasons, with over 20 years experience specializing in an extensive range of stonework services. 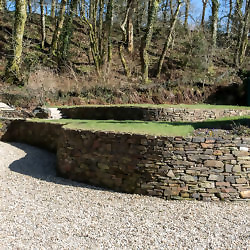 Based on Exmoor within the national park C.F. Kingston and Sons are able to accept projects throughout North Devon, West Somerset and further afield. A large part of our work centres around the heritage craft of dry stone walling - a method of building walls with nothing but interlocking stone. Dry stone walls are an important feature of our landscape and as such we believe that it is a traditional craft that should be carried on for future generations.